As many of you probably know already, 九州 is the southernmost island of the 4 main islands of Japan. 九州, which means nine states, was named after the ancient nine states of Japan: 筑前 (Chikuzen), 筑後 (Chikugo), 肥前 (Hizen), 肥後 (Higo), 豊前 (Buzen), 豊後 (Bungo), 日向 (Hyūga), 大隅 (Osumi), and 薩摩 (Satsuma). Today’s 九州 is divided into seven prefectures, which are 福岡 (Fukuoka), 鹿児島 (Kagoshima), 熊本 (Kumamoto), 宮崎 (Miyazaki), 長崎 (Nagasaki), 大分 (Oita), and 佐賀 (Saga), and are known for its warn climate and delicious food. If you are a fan of Tonkotsu Ramen, you have to try them in Fukuoka! I heard it’s amazing. Yum! Although there seems to be no clear evidence why or when people started calling men from Kyushu 九州男児, it is believed that the word was created during the time of 明治維新 (Meiji Ishin) or the Meiji Restoration, a series of events that restored imperial power of Emperor Meiji from the Tokugawa shogunate. 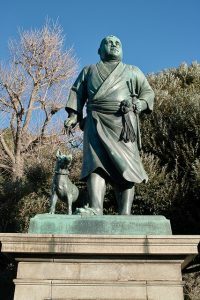 During this historical event, 3 activists form 九州, 西郷隆盛 (Saigo Takamori), 大久保利通 (Okubo Toshimichi), and 木戸孝允 (Kido Takayoshi), played a significant role, and contributed to the success of the restoration and the modernization of Japan. Because of these amazing 3 Kyushu boys, people praised that the men from the region have such outstanding masculine quality. Today it seems to be somewhat difficult to find a pure 九州男児 (who has parents native to Kyushu, and was also born and raised in Kyushu), due to the interminglement of people. So if you are a 九州男児, or know someone who is 九州男児 in your family, be proud of it!